Gaucher disease (GD) is caused by a hereditary deficiency of glucocerebrosidase, resulting in accumulation of glucosylceramide and potentially manifesting as hepatosplenomegaly. We report the case of a 15-month-old boy with chronic neuronopathic GD. The patient had prolonged anemia despite continued iron supplementation for 3 months. White blood count (WBC), hemoglobin (Hb), platelet count, and corrected reticulocyte count were 3,300 /µL, 8.7 g/dL, 90,000 /µL, and 0.55, respectively. The patient had microcytic hypochromic anemia with mildly elevated ferritin. Physical examination revealed hepatosplenomegaly. Bone-marrow aspiration showed sheets of Gaucher cells. Glucocerebrosidase activity in monocytes was significantly lower than normal. Genetic analysis revealed a homozygous L444P mutation of GBA, and he was diagnosed with type 1 GD. Enzyme replacement treatment (ERT) consisting of imiglucerase was initiated and was effective; WBC, Hb, and platelet count gradually normalized and the hepatosplenomegaly improved. However, when the patient entered elementary school, he showed mild impaired cognitive function, and supranuclear gaze palsy occurred the same year. He was ultimately diagnosed with type 3 GD and continued ERT. 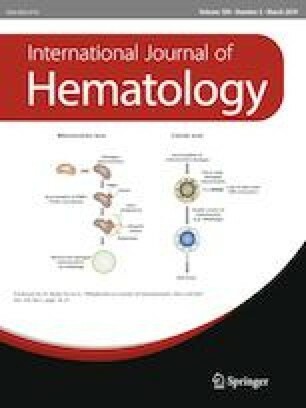 Pediatric hemato-oncologists should be aware of GD, especially when patients exhibit anemia refractory to iron therapy, radiologic bone deformity, neurologic signs or symptoms, and growth retardation. A correction to this article is available online at https://doi.org/10.1007/s12185-018-02590-x. This work was supported by the 2015 Yeungnam University Research Grant.